Fully Customizable Headers � Each page can have it�s own custom header with different height and background image or slider. AJAX Animations ON/OFF � Choose between 4 fluid AJAX animated transitions between pages for a creative experience or turn AJAX off to create a classic website. Besides the predefined animations, create your own scenario by choosing animation type for any page individually. Visual Composer for WordPress ($25 value) � Visual Composer for WordPress will save you tons of time working on the site content. Now you�ll be able to create complex layouts within minutes! Bonus Parallax Pages � SUBWAY comes with an amazing bonus feature � easy to create Parallax pages perfect for presentations, microsites or a new homepage. Easy-To-Use Powerful Admin Interface � SUBWAY comes with very intuitive, easy to use admin interface. Add unlimited sliders and slides while you are editing page/post/portfolio, add unlimited portfolio images or videos while editing your portfolio item, add unlimited parallax section to any page. Side Menu � SUBWAY comes with an amazing side menu widget area. Fully Responsive � SUBWAY is a fully responsive Wordpress theme and works perfectly on all screen sizes and mobile devices. 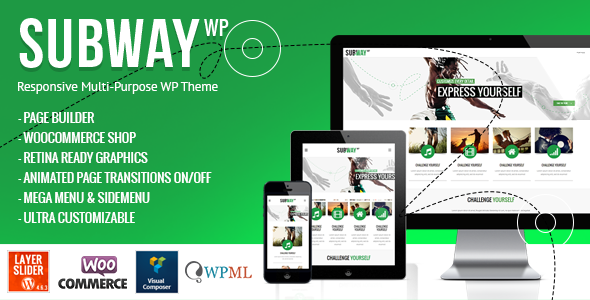 Perfect Code � Coded in HTML5, CCS3 and jQuery, this skillfully constructed theme is 100% valid.